Meywalk® mk3 is a walking aid for people with various types of disabilities. Meywalk® mk3 separates itself from similar products by being equipped with springs, which stimulate and help to develop the gait pattern of the user. The upper part of the frame is spring suspended and it therefore moves with the user providing optimal support through all of the phases of gait. The size of Meywalk® mk3 is set precisely for each user. All settings are easily altered without the use of tools. With Meywalk® mk3 it is possible to change the body posture of the user, which is of great significance for many users suffering from cerebral palsy. By angling the body forward it becomes easier to break a spasticity pattern because gravity now helps to 'push' the user forward - hereby the gait function is stimulated. Featuring a unique lifting and lowering system, getting in and out of Meywalk® mk3 is very easy. First the seat of Meywalk® mk3 is lowered to approximately the same height as the seat of a wheelchair. The user then places his or her wheelchair between the rear wheels of Meywalk® mk3 so the distance to the seat of Meywalk® mk3 is minimized. The user can now with minimal assistance get into the gait trainer and the seat is lifted again. Meywalk® mk3 is available in two sizes, medium and large - the size depends on the length of the user's legs. Each of the two sizes are further fitted with springs that are chosen based on the body weight and a trunk support that is chosen based on the circumference of the chest of the user. 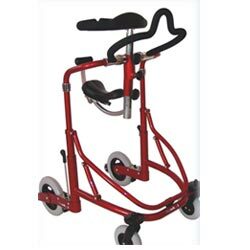 Meywalk® mk3 is available in two colors - black or metallic red. This product is primarily for indoor use but very suitable for outdoor use on hard and flat surfaces. We always recommend that the user is supervised by outdoor use.